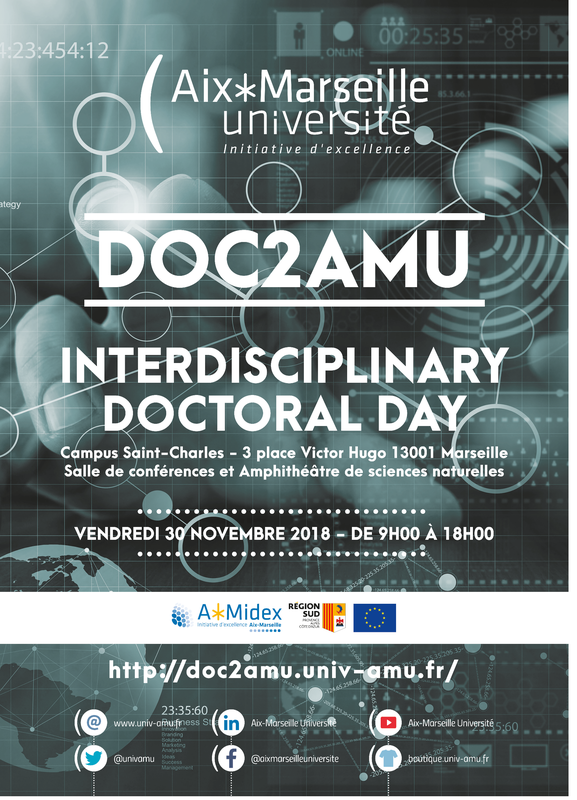 The Aix-Marseille University Doctoral College is pleased to announce the next edition of the DOC2AMU Interdisciplinary Doctoral Day, which will take place on November 30, 2018 at the Saint-Charles Campus (Amphitheater of Natural Sciences), Marseille. This event is organized within the framework of the doctoral program H2020-MSCA-COFUND DOC2AMU (GA713750), co-financed by the Marie-Skłodowska-Curie actions of the European Commission, by the Provence-Alpes-Côte d'Azur Region, and by the foundation A * MIDEX. This day is addressed to PhD students of the University, especially those working on interdisciplinary PhD projects, regardless of their funding program (DOC2AMU, Inter-ED, A * MIDEX, ... etc), and their supervisors to enable those of them conducting interdisciplinary research to meet, present their work and discuss their results. As indicated in the attached program, the day is organized in the form of lectures, short presentations by doctoral students in the final thesis year and poster sessions. All doctoral students conducting interdisciplinary research, whatever the themes, are invited to participate in the program of the day. The deadline for registration is 30 October 2018. For doctoral students registration is done online on ADUM (DOC2AMU INTERDISCIPLINARY DOCTORAL DAY) at the following address: www.adum.fr, tab "Training Catalog". 8 hours of interdisciplinary training may, after evaluation of the day, be counted by PhD students as part of their Individual Training Contract.